The Tomorrow’s Transactions Forum, that is. I arrived in good time (it’s always best to add on a few minutes to give yourself time to buy a ticket) for the 7.39 Flying Glacier to Waterloo via Misery and Degradation. 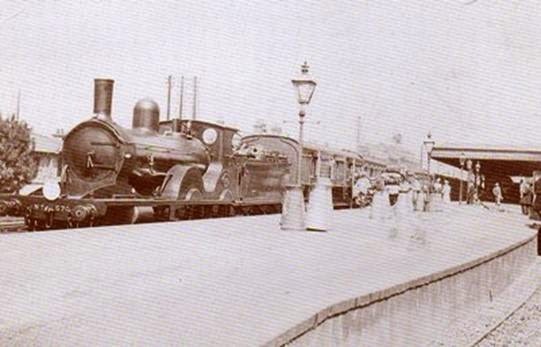 Of course, Woking station has changed a lot since this picture was taken. There’s a Flying Coffee Bean on Platform 2 now. Hurrah! When I got into the ticket hall I discovered that they have installed machines to allow you to pick up a ticket that you have purchased online. Great. I have the excellent The Trainline app on my iPhone and it is integrated beautifully with Apple Pay. So you look up the tickets you want, hit “Pay with Apple Pay”, thumb it and away you go. When you get to the station you just thumb it again and tap your iPhone on the machine, it shows you the list of tickets you have purchased, you choose the ones you want and hey presto your tickets pop out. Except it isn’t. The machines don’t work this way. You have to take a payment card with you and insert it into a slot and then type in a confirmation number that you were sent by e-mail. It’s actually quicker just to go to one of the other machines and buy your ticket in the usual way. The new machine on the block. I don’t get it. Surely the Apple Pay token used to buy the ticket can be matched to the Apple Pay token presented at the machine? You should only need to put the card in if you’re forgotten your phone or it is out of battery (and even then they should do it by implementing PARs properly). Surely South West Trains, when they were planning these machines a few years ago, had at least heard about mobile phones even if they hadn’t actually seen any. And surely they had noticed that something was going with contactless technology? Perhaps one of the South West Train’s Executive Board had overhead their servants talking about “tapping” cards to ride the bus in London and never asked what they meant? Or did they just take it be a some new lingo below stairs, a slang term for writing out a cheque? They must just have thought that contactless was something happening to other people. This left me wondering if other train-like options are adopting contactless. I thought I’d give it a try at Heathrow, so I downloaded the Heathrow Express and tried a couple of times to buy a ticket to see if I could use Apple Pay, but the app asked me to scan in my credit card (presumably for some hello-1996 card-not-present transaction) then crashed, so I never to got to see it in action. So much for joined-up thinking. 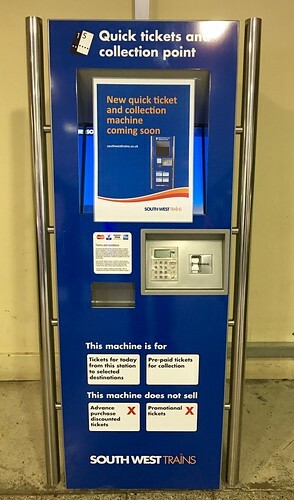 The whole world is moving to contactless and mobile and the most up-to-date technology on the newest machines installed (I see they got rid of the machine for connecting by video link to customer service) is the decade-old chip and PIN reader. Come on. OK, so sometimes there’s a bit of queue. Why can’t we buy our tickets on our phones while riding the bus on the way and then just tap and collect when we get to the station? The only improvement in the ticket purchasing experience at Woking station since it opened on 21st May 1838 — you still stand in line, they still take cash, they still give paper tickets — is that you no longer have to fill out a “reason to travel” form, and I wouldn’t put it past Theresa May to have these re-introduced in time for the next election.